The Céilí is a traditional Irish dance for groups to have a lot of fun. A céilí dance traditionally was a chance for everyone to get together for some socialising with some music and dancing, with the origin of the word céilí meaning companion. Temple Bar Tradfest is a favourite part of Irish culture at The National Wax Museum Plus! It gives us a chance to shake it out Irish style with all the Trad Kids! On Saturday the 26th the Irish Writer’s room will be transformed into a traditional celebration of the Irish Céilí. There’ll be craic agus ceol and some Irish Dancing lessons amongst some of the most traditional Irish Writers this January. 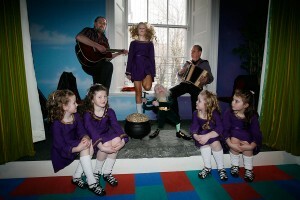 Staff will be on hand to teach the little ones a few jigs and reels!